The Ham Lake Minnesota native is joining forces with Sid Moore Racing and Daniel Needham to take the wheel of the #95 BTG Transport / DIECI Telehandlers entry on December 28, December 30 and January 1. 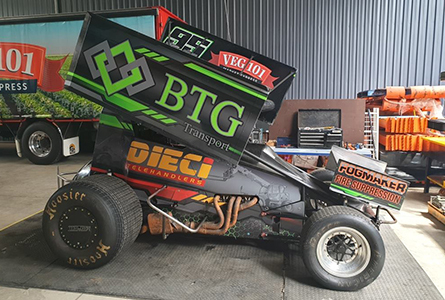 Bowers is a highly regarded 360ci and 410ci racer and currently competes in the UMSS Sprintcar Series in his home state. In 2014 he was the Sprintcar Hall of Fame National 360ci Rookie of the Year and in 2015 and 2016 he won the UMSS Points Series. The 36 year old will first need to conquer his fear of heights to get in the plane for the 14-hour haul to Sydney from LA but he certainly doesn’t have a fear of going fast. Away from racing Sprintcars Ryan plays MN Wild Hockey (Ice) rides motorcycles and snowmobiles and the father of two sons is amped about racing ‘down under’. Bowers, who has scored main event wins at Ogilvie and Cedar Lake Speedways this year, is very much a ‘hands on’ racer not afraid to get his hands dirty and work on all aspects of the race-car. Ryan will compete in three nights over five days at Valvoline Raceway along with fellow Americans Brad Sweet and Donaven Prather. His wild card inclusion is a big bonus for Sydney fans.